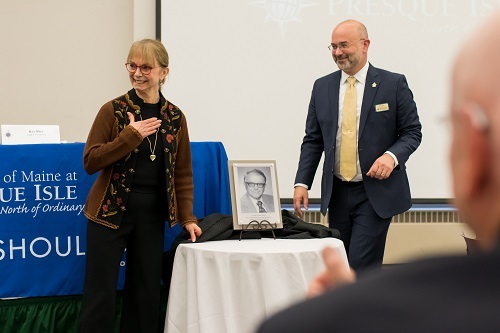 With the stroke of a pen, officials with the University of Maine at Presque Isle received a gift of $1 million from benefactor Mary Barton Akeley Smith to establish the first-ever endowed chair in the institution’s history. The permanent faculty position was formally named the Dr. Robert Vinton Akeley Chair of Agricultural Science and Agribusiness during an official announcement and naming ceremony on Oct. 23. 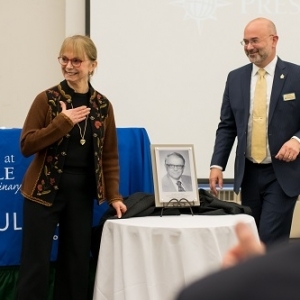 Smith—who lives in California, hails from Presque Isle, and whose generosity has benefited several Presque Isle institutions over the years—offered the gift in honor of her father, Dr. Robert Akeley, and in memory of her husband, Rodney Smith. Smith’s gift to UMPI’s Foundation endows a permanent faculty position within UMPI’s Agricultural Science and Agribusiness program. Funds will support the initial salary and benefits for the position as well as start-up costs of the program during the first four years—including equipment for the program and greenhouse, and summer research fellowships—with the balance held in an endowment. The endowed resources guarantee a strong future for the program, providing the Chair with additional resources for research, including financial support for student research, industry partnership, and program development and delivery. The endowed chair is named in honor of Dr. Robert Vinton Akeley, a Presque Isle native who was an internationally known potato breeder and leader of the United States Department of Agriculture’s National Potato Breeding Program. Growing up on a potato farm, he started his career with the crop at an early age. In 1932, at age 22, Akeley joined the Federal Program of Potato Investigations as a student-helper. He attended the University of Maine, graduating in 1937 with a Bachelor’s degree in Agronomy and in 1942 with a Master’s degree in Botany. In 1942, he began conducting the Potato Breeding Program at the Aroostook Farm in Presque Isle for the Federal Program of Potato Investigations. In 1956, he transferred to Maryland to serve as leader of the National Potato Breeding Program, and in 1960, he assumed the leadership of Potato Investigations. Akeley was directly or indirectly responsible for the release of 40 new potato varieties, including the Kennebec. His work in potato breeding received international recognition, and he authored more than 100 publications. He worked collaboratively with farmers, growers, processors, and fellow researchers in more than 30 states and 9 countries, all with a focus on potato culture varietal excellence. He was a fellow of the American Association for the Advancement of Science and a member of the Genetic Association of America. In 1967, the University of Maine recognized Dr. Akeley’s leadership and outstanding research in potato improvement by conferring on him an Honorary Doctor of Science degree and the Potato Association of America presented Dr. Akeley for Honorary Life Membership. The Dr. Robert Vinton Akeley Chair will allow UMPI officials to build upon the newly established Agricultural Science and Agribusiness program. University officials said Smith’s historic gift will create a lasting impact for the institution and the agriculture industry.